﻿That’s right, coming in at #1 in bluegrass for 2018 is a tie among three albums. I’m a huge fan of the ol’ five-disc CD changer and recently put these three in rotation (along with Tyler Childers’ 2017 release, Purgatory, and some ‘70s-era Marshall Tucker Band). I often had a hard time distinguishing one from the others. If you have a day ahead in your life with plans to be around the house, starting into a few beers in the early afternoon, as you work toward the backyard grill with friends stopping over – I couldn’t recommend this mix more. I’m sure there’s a five-disc changer at your local pawn shop, you should damn well already have Purgatory, and Marshall Tucker Band’s A New Life can be ordered at your nearest record store. And for a few words on each of these “tying-for-first” best bluegrass albums of 2018: I admit with no shame that Town Mountain has made my “Top 10” list every year that they’ve put out an album. The reason is quite simple: they’re the best. Ha. Please don’t take this as demeaning the fluid jams of the Infamous Stringdusters or the dark and truthful songwriting of Greensky Bluegrass or the rock of Leftover Salmon. I’d make a bet that the musicians of those groups would agree when it comes to life on the road, straight-ahead lonesome original songwriting with a heavy lean toward that honky-tonk early bluegrass sound, Town Mountain is the best. And that’s the sound I love. Bobby Britt. Photo by Libby Gamble. Bobby Britt walks the line. He’s young and he’s seasoned. He’s old-time and he’s bluegrass. He’s technical and he’s natural. His album, Alaya pulls these juxtaposing forces together with each bowing note and lingering, melodic line. Additional treats on the album include Andrew Marlin on vocals, as well as Allison de Groot on clawhammer banjo (distinct and pronounced throughout the recordings). As fans of Mandolin Orange know, Marlin’s vocals are haunting, crying, yet laidback, while delivering a song as a story to hold on to and remember for its lessons to learn. With Charles Humphrey III leaving a steady gig to tour with his bluegrass brethren of Songs From The Road Band, they have become a road-warrior, live-in-concert version of what many have known only as an under-the-radar outlet for Charles’ original songwriting prowess. Even with the under-the-radar nomenclature, Songs From The Road Band has hardly been resting on the laurels of Charles’ success with the Steep Canyon Rangers, or sitting idle until his next muse might happen by – this is their fourth release, with the first dating back to 2006! Like previous releases, Road to Nowhere brings together the superb talents of Charles’ cowriters (Jim Lauderdale, Shawn Camp, Phil Barker) and musician friends from decades in bluegrass music (Andy Thorn, Robert Greer, Jon Stickley). Here we also find the common thread (fiddle string?) of our top three tying bluegrass albums of 2018: Bobby Britt. *Songs From The Road Band can be seen at the Durango Bluegrass Meltdown, April 12-14. John Duffey is like the Rodney Dangerfield of bluegrass: “I don’t get no respect!” His stage presence was also more in line with Dangerfield than the polished acts of his day. But I loved it, and I was honored to see it, many times growing up in Northern Virginia in the shadow of the Birchmere. The respect I’ve always had for John Duffey is spreading, both through this exceptional collection of music, and an upcoming biography, coauthored by non other than Country Gentlemen and Seldom Scene Duffey collaborator, Tom Gray. Epilogue is high on my list for a couple reasons: the nostalgia factor that I allude to, and the fact that the release is no “Greatest Hits” of catalog material. This is newly recorded bluegrass by the friends, musical partners and admirers of John Duffey – the best of the best – giving their epilogue to a late great. *Album contributors Sam Bush and Bela Fleck can be seen at the Telluride Bluegrass Festival, June 22-24. Sometimes I wish I lived in Nashville just to happen into the Station Inn on random weeknights and hear Roland White pick and sing. While my observations are from afar, he seems to be like the house band there, performing often and with a rotating cast of band members and sit-ins, all anxious and honored to join the living legend in musical collaboration. And this sums up the release, one that should be called Roland White and Friends – Tribute to Roland White. While David Grier, Molly Tuttle and Billy Strings no doubt have brother Clarence channeled, in listening to the album every note sings out in honor of a true ambassador of the genre: Roland White. This release also deserves a shout out to another bluegrass ambassador, Jon Weisberger, who co-produced the release, plays bass, sings and helped gather many of today’s most standout musicians to contribute to this honest tribute. *Weisberger will be with his regular band, Chris Jones and the Night Drivers, in neighboring Utah, June 1-2 at the Ogden Music Festival. I once made the bold statement that FY5 are the Hot Rize for the modern-day generation of bluegrass fans. That statement was not meant to declare Hot Rize as a thing of the past (I hope all readers were able to take in one of their 40th Anniversary shows), but instead the statement is meant to compliment FY5 to the highest degree. The group have the interplay, songwriting, tone, humble stage presence and skill of that fabled quartet – along with a modern (dare I say rebellious?) streak that’s all their own. *FY5 will be at the Durango Bluegrass Meltdown, April 12-14, as well as the Pagosa Folk ‘N Bluegrass Festival, June 7-9. Making the list due to my first love in bluegrass: the traditional, real deal, high lonesome sound. I place David Davis in a small group of players who truly bring forth traditional bluegrass in the modern day: Travers Chandler, Audie Blaylock, Danny Paisley, Junior Sisk, and with the passing of James King, that’s about it. And it doesn’t get much better than an old-time bluegrass musician covering the old-time songs of an old-time banjo player. *Good luck catching David Davis and the Warrior River Boys west of the Mississippi, but more information can be found at http://www.daviddavisandwrb.com. The Grateful Dead haven’t been covered this many times since Vassar sat in with Dead Grass. Though, like that late great fiddle master, the McCoury boys have reason to bring a Jerry Garcia favorite into the mix: they actually have history with the guy! And, unlike many, many Dead covers in the modern-day (unfortunately), they do these songs justice. On that note, the album is worth ten gold dollars for their nearly eight-minute cover of “Loser” alone. *The Travelin’ McCourys will be at the Pagosa Folk ‘N Bluegrass Festival, June 7-9. Read Summers Baker’s concert review of The Travelin’ MCourys here. As previously stated, my first love in bluegrass is the traditional sound. But nowadays give me a smoky venue with cheep beer on tap, a kind stranger buying shots, friends gathering, a horizon of mountain peaks, snow in the forecast with accumulation just starting, a questionable place to stay for the night, my true love by my side, a Rockmount embroidered snap shirt, running into a dear friend I haven’t seen in years and Leftover Salmon on stage. *Leftover Salmon can be seen, heard, and felt at “Boogie on the Broadmoor” in Colorado Spring, March 22-24. I’ve never been a huge fan of instrumental, technically brilliant bluegrass (having always leaned more toward a grittier, vocal-driven style). But, every so often a recording comes out that shows me what I’ve been missing in not embracing this modern-day aspect of the genre. I realize that instrumental bluegrass albums have been released since the earliest days; I say “modern-day” because it seems like 10 years ago or so, a new movement came to bluegrass. I call it the, “Berklee Sound.” I’m referencing of course the hallowed halls of Boston’s Berklee School of Music, where young pickers have been graduating and bringing their flawless style to the national scene. With Hawktail you can hear the transition from the scholastic notes of the classroom, to the melodies, tone, and feeling that these hardworking musicians have learned in the school of life, on the road. *Although the band won’t be out west anytime soon, more information can be found at http://www.hawktailmusic.com. In our June/July issue of Pow'r Pickin', Max Paley interviewed The Rev from the Lil Smokies. Max says: The Lil' Smokies play a dual role for the modern bluegrass scene in that they appreciate and draw from the bluegrass tradition while not being afraid to stretch the boundaries of the genre a bit. This video in particular shows their vocal proficiency with 3-part harmonies and presents them in their best acoustic sense. This song "Go Back" talks about how you can't live in the past, but you can go back to visit every now and again with the Smokies as your time-traveling soundtrack! Pick up your copy of Pow'r Pickin' at member music venues and stores in Colorado or subscribe by joining the Colorado Bluegrass Music Society today! June/July issue of Pow'r Pickin' - Introducing Dave Bruzza of Greensky Bluegrass. 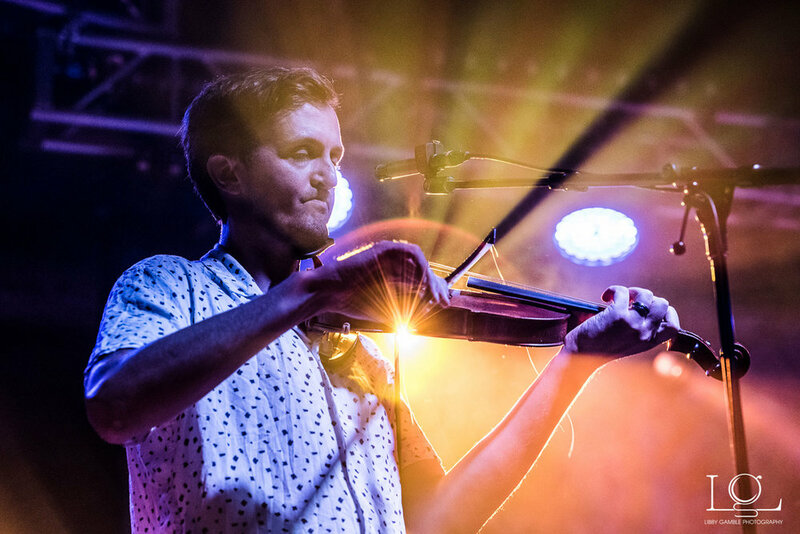 Max Paley, writing in our June/July issue of Pow'r Pickin', introduces us to Dave Bruzza of Greensky Bluegrass. Max says: Greensky Bluegrass have brought their genre-busting energy to stages across the U.S. and internationally for close to 20 years now, and this song is a great example of how they can effortlessly transform Prince's pop sound to acoustic instruments while keeping the energy sky high. If you want to receive Pow'r Pickin' in your mail box every two months, become a member of CBMS! Alison Brown gathered this group of amazing musicians together to record "Swept Away," the title track to Missy Raines' latest album, which Brown produced. The group is comprised of IBMA best instrument winners Raines (bass), Brown (banjo), Sierra Hull (mandolin), Becky Buller (fiddle) and Molly Tuttle (guitar). Read about this bluegrass supergroup, performing at RockyGrass, in the June/July 2018 issue of Pow'r Pickin'! Check out the cover article of the June - July 2018 Pow'r Pickin' to find out why Alison Brown is so excited to perform with this group. And, she tells us, "It wouldn’t be RockyGrass without a few surprise guests!" You can get your own subscription to Pow'r Pickin' by becoming a member of the Colorado Bluegrass Music Society.